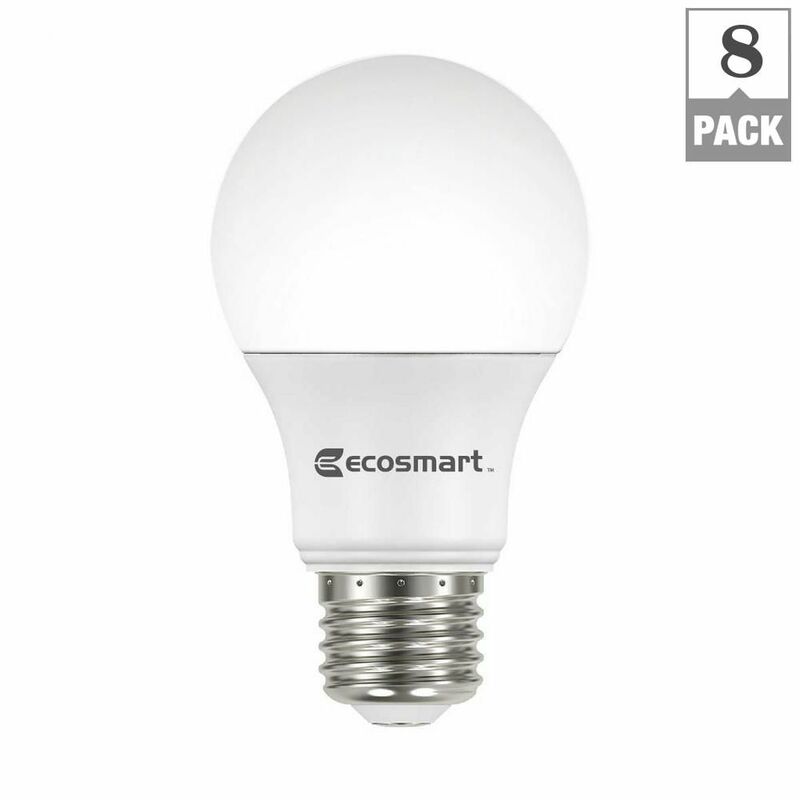 For a standard light bulb that will work perfectly in the bathroom, one of the best options is the EcoSmart 60-Watt Equivalent A19 Non-Dimmable Basic LED Light Bulb. Not only will these LED bulbs help you save on energy costs, but their “daylight” hue will give you a bright task light that’s ideal for makeup application, shaving, and more. These super affordable light bulbs come in packs of eight, and each bulb is a 60-watt equivalent that projects 840 lumens of light, making them perfect for rooms where you want a bright, crisp light. The estimated yearly cost of these bulbs is a mere $1.08, based on three hours of daily use, and the bulbs can last for an impressive 10 years! Many reviewers choose to use these EcoSmart Daylight Light Bulbs in the bathroom thanks to the clear light they give off. Several note that these bulbs do reduce energy costs and last a long time, to boot! Some people prefer to have dimmable light bulbs in their bathroom, as this allows you to lower the brightness during late night bathroom runs or while you take a relaxing bath. If this sounds appealing to you, check out the Hyperikon A19 Dimmable LED Light Bulb, which comes in packs of six. These light bulbs have a soft white glow that many people prefer for their bathrooms, and each is a 60-watt equivalent that products 820 lumens of light. These Energy Star-qualified bulbs claim to provide true color rendering that provides near-sunlight quality light, and they can be dimmed down to 20 percent with a compatible dimmer switch. If you want an ultra-bright light bulb for your bathroom, you may want to consider a CFL, or Compact Fluorescent Light, bulb. These products are similar to the overhead fluorescent tubes that are used in commercial spaces, but they’re designed for home use. One highly-rated CFL bulb is the Philips 100-Watt Equivalent T2 Twister CFL Light Bulb Daylight Deluxe. This 100-watt equivalent “daylight” bulb has a unique spiral shape, and it provides a whopping 1,600 lumens of light—double that of many other popular light bulbs for bathrooms. Philips claims these bulbs use 77 percent less energy than standard incandescent bulbs, and they’re supposed to last for more than nine years when used for three hours a day. Reviewers note that these Energy Star-qualified bulbs provide a crisp, cool light that’s much brighter than standard bulbs. If you want to illuminate your bathroom better, these Philips CFL light bulbs may be the way to go! However, note that these bulbs contain mercury, so you will have to take special precautions if you break or need to dispose of them. Are you working toward creating a high-tech smart home? Then you should consider purchasing a smart light bulb for your bathroom! While significantly more expensive than other options, smart light bulbs like the LIFX (BR30) Wi-Fi Smart LED Light Bulb deliver big on functionality, allowing you to control them remotely using your phone. This smart light bulb is equivalent to a 75-watt bulb, and it can be adjusted to give off just about any type of light you desire, from warm to cool tones, as well as millions of vibrant colors. The LIFX Wi-Fi LED bulb can last up to 22 years, based on three hours of daily use, and all its cool features can be controlled right from your phone. As smart light bulbs go, this is one of the easier options to install, as it doesn’t require a hub. Reviewers love the functionality that comes with these smart light bulbs, writing that it’s neat to be able to choose between warm and cool tones. Plus, the LIFX bulbs are compatible with Amazon’s Alexa, so you can control them with voice commands if you have an Echo or another Alexa-enabled device. If you have a vanity in your bathroom, you may be looking for the special decorative globe light bulbs that are standard in these setups. One of the best options for vanity light bulbs is the TCP Decorative Globe Vanity Light Bulbs, which come in both daylight and soft white options, depending on your preference. These LED light bulbs are a 40-watt equivalent with an impressive life span of up to 22 years! Because they’re designed to be used in vanities, these bulbs have a sleek globe shape and a frosted finish. The bulbs give off 350 lumens—this may seem low, but keep in mind that you’ll probably be using several of them around your vanity. As an added bonus, the operating costs for these bulbs are just $0.60 a year, saving you on energy costs over the course of their life. According to reviewers, the TCP Decorative Globe Vanity Light Bulbs are great for the bathroom, as they provide a crisp, bright light without being blinding. Several note these bulbs use much less energy than standard incandescents, and many love that you rarely have to replace these vanity light bulbs. Most women know the struggle of perfecting your makeup indoors, then having it look completely different in natural light. For this reason, it’s important to have high-quality light bulbs in the area where you apply your makeup. If you’re looking for a light bulb for makeup application, try the AmazonBasics A19 LED Light Bulb. This 75-watt equivalent LED gives off an impressive 1,000 lumens, and it’s designed to simulate daylight, allowing you to feel confident in your makeup application. These bulbs cost just $1.39 per year to operate, and they have an estimated lifespan of 13 years, based on three hours of daily use. Reviewers call these bulbs the “best light bulbs ever,” thanks to their impressive illumination, bright color, and affordable price. Several write that the “daylight” option is very clear—no yellow tones to be found—making it a good choice for makeup application. Most rooms have at least one source of supplemental natural light from a window or skylight, but sometimes bathrooms get the short end of the stick, having no windows at all! If your bathroom doesn’t have windows, you need a powerful light bulb to make up for that lack of natural light. That’s where the LOHAS LED Bulb comes in. These light bulbs are 150 to 200-watt equivalents, and they provide a whopping 2,500 lumens of light. They’re designed to give off a daylight-type illumination, ensuring your windowless bathroom isn’t tinted in a yellow glow, and the lifespan of these bulbs is around 30,000 hours. Reviewers say that these light bulbs are great for low-light areas, as they provide a bright, clear light that reaches into all corners of the room. Many note that the light is diffused evenly, and because the bulbs are LED, they can help reduce your energy costs. What’s not to love?